Blank joins up with Russell’s camp at the apex of the performer’s career, when success has allowed him an opportunity to build a recording studio in his home state. Blank’s team follows Russell throughout the construction, though they don’t always stay around to watch the hammers swing. Interspersed with these scenes are snapshots from the road, including full performances and dalliances backstage. For much of A Poem is a Naked Person, these are our only real glimpses of Russell. Probably unsurprising to anyone who knows Blank’s work, the director spends much of the movie looking at the world around his subject, getting reactions from the locals regarding their famous new neighbor or watching as Jim Franklin, the man painting a mural on the bottom of Russell’s pool, catches scorpions before putting brush to concrete. Or stepping away from people altogether to look at the natural environs. 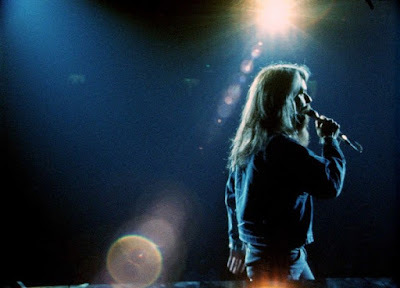 This impulse to cast his glance sideways keeps A Poem is a Naked Person from being a great music documentary, but Blank makes up for it by basically inventing something that is its own beast. 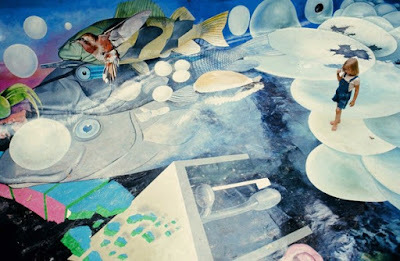 Throughout his work, he has been fascinated by Americana and folk art, and there are subtle touches here, like the Hank Williams façade on the front of a building, or the accidental visual echo of the man with the butterfly tattoo hearkening back to the butterfly imagery in that painting on Russell’s pool. Even the rootsy music that Russell covers in his concerts remind us of a musical tradition that stretches back to the earliest days of our nation. Not to mention added performances by George Jones and Willie Nelson, themselves legends in the country music field. 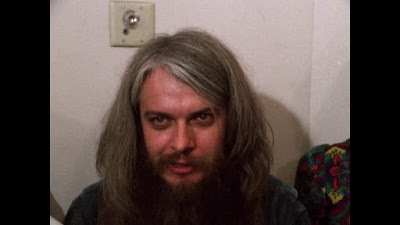 The downside is that if you’re looking to learn more about Leon Russell, you’re probably going to be better off reading his Wikipedia entry alongside the film. He doesn’t step out from behind the piano and start to emerge as a character until about halfway through the movie. And even then, since Blank never interviews him directly, he remains an enigma, almost entirely in control of what he shows the camera lens. 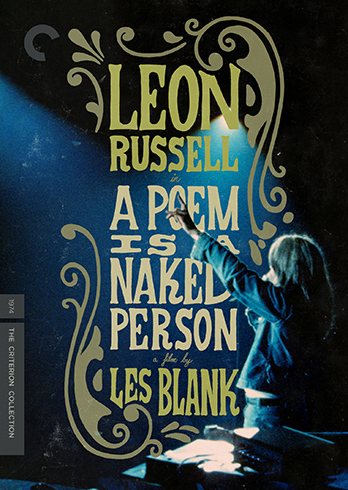 One is quickly reminded of Bob Dylan in Don’t Look Back [review], especially so in a scene where Russell sarcastically dresses down a musician using his studio who steps to him in the wrong way. The way the elder statesman verbally bats around the young newbie (Eric Andersen) and puts him on the defensive is up there with Dylan’s humiliation of Donovan, right down to the lesser’s naïve sincerity. But then maybe the code to this thing is right there in the title: A Poem is a Naked Person. Blank is creating something evocative of the man and his art, and through these captured impressions exposing something about both. 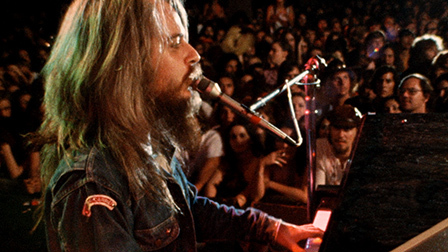 He doesn’t exactly strip Leon Russell bare and show him off to the world, but perhaps he exposes more of the personage by suggesting the image dominates all that may be underneath. There are also supplements looking back at the making of the film, including a more recent conversation between Russell and Les Blank’s son Harrod, in which Russell discusses why he initially disliked the film and kept it out of circulation for years. Turns out, he didn’t think it was about him enough either! So is the naked person being put on display really Les Blank after all? Leon seems to think so.